Sustainably safe road traffic, also known as Sustainable Safety, means that road traffic is organized in such a way that serious crashes are prevented, and if a crash does occur, the severity of the outcome remains limited. The Sustainable Safety vision of the Netherlands takes as its starting point that 'humans are the measure of all things': it is the human being who is vulnerable, fallible and does not always abide by the rules. The physical environment of the road user (e.g. road design, road environment and vehicle) must support the competences and protect the vulnerability of road users. In addition, road users must be prepared for the traffic task in the best possible way by information and education. Finally it needs to be checked if road users behave safely. These were the starting points for a number of Sustainable Safety measures which were implemented in the Netherlands after conception of the vision in the ‘90s. These measures were estimated to have resulted in more than 30% fewer road deaths in 2007, relative to the year 1998. Until now and based on the first update of the vision in 2005/2006, the Sustainable Safety insights have been elaborated in five safety principles: Functionality, Homogeneity, Predictability, Forgivingness and State awareness. In order to provide more room for effective measures that fit to remaining road safety problems and future developments of the coming decade, the vision has recently been updated: Sustainable Safety version 3. In this third version of the vision, some of the safety principles have been merged and enlarged in scope to offer room for several possible elaborations (e.g. : road design versus technology). This has resulted in three design principles: FUNCTIONALITY of roads, (BIO)MECHANICS and PSYCHOLOGICS with those last two principles directed at respectively compatibility of (bio)mechanical components in road traffic and compatibility of system design with the competences of road users. Furthermore, two new principles were added that focus on the organisation of the safe system: effectively allocated RESPONSIBILITY and LEARNING AND INNOVATION of the system. Besides an ideal situation per principle, this third version also discusses customization in problematic situations and phasing solutions to approach the ideal situation. Vulnerable road users are key in all these solutions. This factsheet currently describes the principles that arrived from the previous update of 2005/2006. It will be replaced by more information on the new update from 2018 in the near future. What does the Sustainable Safety principle 'Functionality of roads’ entail? According to the principle ‘functionality of roads’ there must be monofunctionality of roads in a road network. 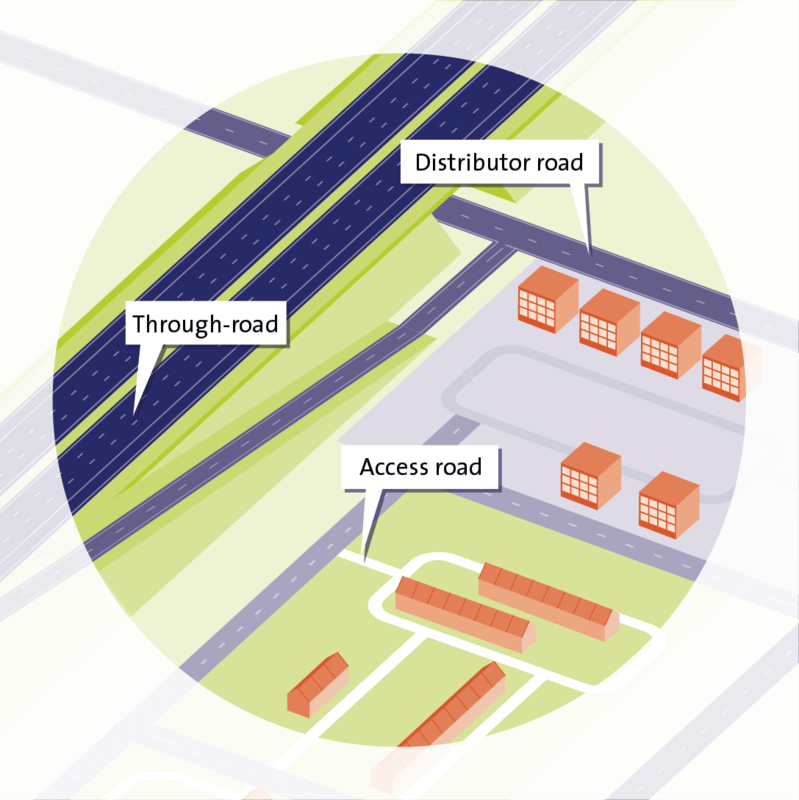 Three different road types are distinguished : Through roads, which allow the traffic to ‘flow’, Access roads, which provide access to destinations (exchange of traffic) and Distributor roads, which have a flow function on road sections and an exchange function at intersections. See SWOV Fact sheet Principles for safe road design. Figure 1: Monofunctionality of roads in a hierarchic road network according to Sustainable Safety. What does the Sustainable Safety principle ‘Homogeneity of speed, direction and mass entail? The aim of this principle is to minimize the differences in mass, speed and directions of travel. Are there large mass differences between road users in the same traffic space? Then speeds must be so low that a crash does not lead to serious injury for the most vulnerable road users. Does traffic move at high speeds? Then road users with high and low speed and road users with different directions of travel must be separated from each other as much as possible, and be protected by their vehicle. This way conflicts leading to serious injury are prevented as much as possible. Based on research into the outcome of collisions between pedestrians and cars (zie www.euroncap.com) , SWOV has proposed ‘safe speeds’ that are related to the situation on the road (see Table 1 for the essence)   . afe speeds' fit the traffic situation and thereby reduce the risk of a (serious) crash to a minimum. These speeds have been inspired by the Swedish road safety vision Vision Zero . More information can be found in the SWOV Fact sheet Speed and speed management. Table 1: Safe speeds, given the encounters between different road users . NB: safe speeds also depend on the obstacle-free zone along the road. What does the Sustainable Safety principle 'Predictability of road design of the road' entail? 'Predictability of road design' means that the road design evokes expectations that match the actual traffic situation and that the actual road course is predictable. This predictability of road design adds to predictable behaviour of road users . Road users can act more on routine, thus reducing the risk of (dangerous) errors   . For a predictable road design it is important that road types are distinguishable, that roads of the same type are sufficiently similar, ánd that the design elements of the road evoke the correct expectations  . Currently, the predictability of roads in the Netherlands is mainly conducted by using markings that differ per road type  (zie Table 2). In addition, the predictability of motorways is very high due to the presence of emergency lanes, portals and guide rails . The predictability principle has a strong link with the credibility of the road design, both in terms of the rules in force and of the use of the road . A credible speed limit is in accordance with the road design to such an extent that it evokes the desired speed more or less automatically . This makes a credible speed limit into a good example of a predictable road design and legislation. See also SWOV Fact sheet Speed and speed management. Table 2: Essential predictability characteristics in detail . Each road type has its own zone indication; the marking has been developed per road type and can be applied both in urban and in rural areas. 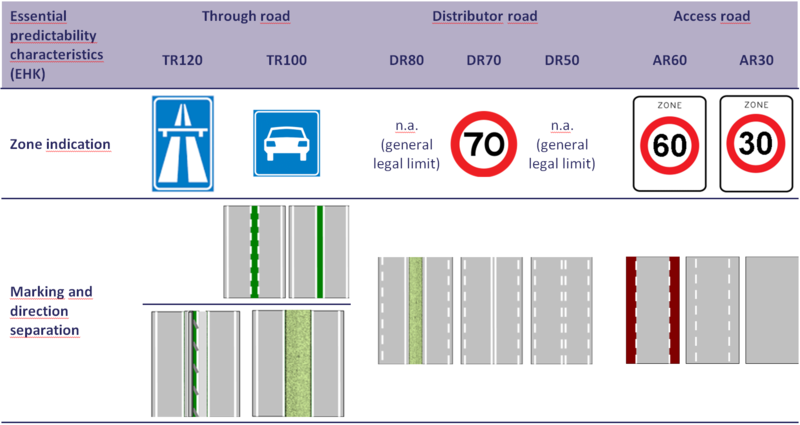 The physical direction separation is used for both regional (TR100) and national through roads (TR120). The guidelines also allow the use of a green centre marking for regional through roads. What does the Sustainable Safety principle ‘Forgivingness of the environment and of road users’ entail? This principle aims to limit the effects of errors of road users. 'Forgivingness' can refer to the road environment (physical forgivingness) and to the road user (social forgivingness). A forgiving environment ensures that the consequences of errors made remain limited. For example, someone can run off the road due to driving too fast. Physical road elements such as a semi-hard shoulder, obstacle-free zones or crash-friendly shielding of obstacles must limit the effects of the loss of control. See also SWOV Fact sheet Principles for safe road design and the archived SWOV Fact sheet Run-off-road crashes. Social forgivingness  means that road users respond to situations, errors or unsafe conduct of another road user in such a way that they do not lead to a crash, for example by allowing sufficient space and time. An example is keeping a wide passing distance from cyclists, especially in strong winds. Social forgiveness is mainly influenced by competencies (being capable) and motivation (willingness). This requires timely identification of problems and being able and willing to respond. What does the Sustainable Safety principle ‘State awareness by the road user’ entail? The principle of ‘state awareness ' means that road users themselves are able to assess whether they still are sufficiently able to participate in traffic, or: is one (still) capable to perform the task? On the one hand, task competence is affected by permanent properties (competencies or driving skills) and the temporary condition (fitness to drive) of the road user  . Novice drivers, for instance, do not yet have very good driving skills (see SWOV Fact sheet 18- to 24-year-olds: young drivers). Due to their still limited competencies their task competence will also be more limited than that of a more experienced road user. Another example are employees who, e.g. after shift work, are tired behind the wheel and have a temporarily reduced fitness to drive. On the other hand, the task requirements play a role: the external conditions in which road users have to perform their traffic task such as traffic volume, weather conditions. Even with a reduced task competence, road users must continually ensure that they can travel safely, for example by not using the car, choosing the safest route, or by using larger safety margins (calibration or tuning task requirements and task competence, but also tuning competencies and task competence). How did Sustainable Safety come into existence? The Sustainable Safety vision was formed in the early 1990s based on research insights into human action in an environment that is insufficiently tuned to human abilities. These insights had already been applied in process industry and aviation  In the mid-1990s, the Ministry of Transport in the Netherlands started a number of regional demonstration projects   that were the prelude to the covenant Start-up Programme Sustainable Safety: an agreement between the Government and decentralized authorities on the implementation of the first phase of Sustainable Safety . In the years that followed, all roads were categorized, many 30 km/h and 60 km/h zones were constructed or expanded, the moped was moved to the roadway where this could be done safely, all traffic coming from the right was given priority (also slow traffic), preparations were made for permanent traffic education, and regional anchoring and intensification of traffic enforcement was carried out. In 2005, the second phase of Sustainable Safety was no longer recorded in separate agreements, but was made part of the general policy plans  . In addition to continued implementation of measures in the spirit of Sustainable Safety, the construction of the so-called 'essential predictability characteristics' (EHK) were included in the programme as a new element. Has Sustainable Safety made traffic safer? Based on an analysis of different evaluations, we can say that measures from the Sustainable Safety Start-up programme and further measures that fit into the Sustainable Safety vision have resulted in a reduction in the number of road deaths of more than 30% in ten years (2007 compared to 1998) . This reduction mainly concerned road deaths in crashes involving motorized traffic: after all, the measures were especially targeted at these types of conflicts. The benefits of the Sustainable Safety policy during the same period proved to be 2 to 4 times higher than the costs . What other road safety visions are there? Sustainable Safety is one of the road safety visions that are internationally known as 'safe system approach' and has several times been named one of the examples in this field by, among others, OECD  . A 'safe system approach’ – other than the traditionally widely used reactive or ' black-spot approach ' – has the proactive prevention of system failure in traffic as its starting point. Listed below are other 'safe system’ approaches and significant other visions. Another well-known example of a ' safe system approach is 'Vision Zero' from Sweden. This vision argues that it is immoral to accept fatalities and serious road injuries. Like Sustainable Safety, Vision Zero also has 'humans as the measure of all things' as leading principle in its safety vision. Safe road design, good legislation and enforcement are the responsibility of the Government . The citizen has the responsibility to abide by the rules. Unlike Sustainable Safety, education and information are no (explicit) part of the Swedish safety vision . The European Union (for 2050) and other countries and cities have also embraced 'Vision Zero' as their approach, including the United Kingdom, Luxembourg and several major cities in Europe and North America, see also OECD/ITF, 2016 . Especially the moral starting point to no longer accept casualties is a common element. proactive system approach ('safe system approach') is characterized by the idea that risks are inherent to traffic and that these risks require an integrated approach to the various elements of the system that take into account the human vulnerability and fallibility as well as possible. This requires involvement of all relevant actors, such as road authorities, police, justice, and also companies. The road users are required to comply with the rules, but where they fail to do so, the traffic system is corrective (informing, enforcing) and forgiving (no serious consequences or errors). A proactive system approach also sets out to, among other things, to increase the social awareness of road safety. First, because people are only partly aware of the inherent risks in traffic, and second, because they see only a limited number of crashes in their environment, and are not aware of how these add up to a considerable problem. In addition to the Netherlands and Sweden, countries such as Australia(externe link) and New Zealand(externe link) also have a proactive system approach for their road safety policy. Only in the Netherlands and in Sweden this approach has a specific name (Sustainable Safety and Vision Zero, respectively). Proactive road safety policy in the Netherlands already started with the implementation of Sustainable Safety measures. Proactive policy means that the traffic system is made safer even before crashes have occurred, and that this policy is based on scientific knowledge on crash causes and effective measures. So far, this proactive policy has mainly been conducted by applying measures at those types of locations and aimed at those groups of road users about which is known which road safety problems may occur. As yet, this policy is mostly not guided by risk factors of specific locations or areas: road design characteristics, hazardous behaviours of road users, or other so-called Safety Performance Indicators (SPI’s; ). SPIs are indicators of risk factors or conditions of the traffic system that have a strong causal relationship with the occurence or severity of road crashes (see, for example, ETSC, 2001 . Therefore SPIs are 'indicators' of traffic hazards, on which proactive policy can focus. Risk-based policy is based on the scores on one or more of these SPIs and tackles road safety problems on the basis of this. A similar approach has already been used in Sweden for a number of years  , where SPIs are also linked to actors who may influence that specific indicator, such as road authorities, insurance companies, the taxi industry or enforcement officers. The traffic concept ‘Shared Space’ does not exclusively focus on road safety, but also includes the overall design of public space, in particular that of urban areas. Like Sustainable Safety, the Shared Space vision also sets requirements for a credible design of residential areas from the perspective that fast traffic is a guest in these areas and that speeds should therefore be low  . And, like Sustainable Safety, it stresses the importance of a good road network structure with sufficient through roads to prevent the unwanted presence of rat-run traffic in residential areas. According to the Shared Space vision, traffic conflicts are solved more easily by adding uncertainty to the traffic situation by applying the minimum number of traffic signs and markings. Road users would then be more careful and solve potential traffic conflicts together, for example by the use of eye contact. Sustainable Safety, on the other hand, has 'recognition and predictability' as its starting point. Shared Space wants to achieve the credibility of the road layout by mainly using ‘natural’ elements. Shared Space wants the credibility of the device especially with' natural ' elements. Sustainable Safety does not exclude this – provided it leads to lower travel speeds and safe encounters – but also uses traditional traffic measures (speed humps, plateaus, road narrowings) that have proven effective speed reduction effects. Until now, Shared Space has not yet been thoroughly evaluated; the road safety effect of this traffic concept is therefore still unknown. Below you will find the list of references that are used in this fact sheet. Our knowledge portal offers more literature on this subject.
. Janssen, S.T.M.C. (1974). Verkeersveiligheid als criterium voor het wegontwerp. Pre-adviezen congresdag 1974. In: Wegontwerp en wegverlichting tegen de achtergrond van de verkeersveiligheid. 6 december 1974, Utrecht, 's-Gravenhage, Vereniging Het Nederlandsche Wegencongres, p. 13-40.
. Wegman, F.C.M. & Aarts, L.T. (2006). Advancing Sustainable Safety; National Road Safety Outlook for 2005-2020.. SWOV, Leidschendam.
. Aarts, L.T. & Van Nes, N. (2007). Een helpende hand bij snelhedenbeleid gericht op veiligheid en geloofwaardigheid. Eerste aanzet voor een beslissingsondersteunend instrument voor veilige snelheden en geloofwaardige snelheidslimieten. D-2007-2. SWOV, Leidschendam.
. Aarts, L., Pumberger, A., Lawton, B., Charman, S., et al. (2011). Road authority pilot and feasibility study. Deliverables 3 and 4 of the ERASER project. SWOV, Leidschendam.
. Theeuwes, J. & Hagenzieker, M.P. (1991). Visual search of traffic scenes: on the effect of location expectations. In: Gale, A.G., et al. (red. ), Vision in Vehicles IV; Proceedings of the Fourth International Conference on Vision in Vehicles, University of Leiden, the Netherlands. 27-29 August 1991, Amsterdam, North-Holland, p. 149-158.
. Rasmussen, J. (1983). Skills, rules, and knowledge: signals, signs, and symbols, and other distinctions in human performance models. In: IEEE Transactions on Systems, Man, and Cybernetics, vol. SMC-13, p. 257-266.
. Reason, J. (1991). Human error. Cambridge University Press, Cambridge.
. Reason, J., Manstead, A., Stradling, S., Baxter, J., et al. (1990). Errors and violations on the road: a real distinction? In: Ergonomics, vol. 33, nr. 10/11, p. 1315-1332.
. Theeuwes, J. & Diks, G. (1995). Categorisering van omgevingen: een overzicht van de literatuur. TM 1995 B-2. TNO Technische Menskunde, Soesterberg.
. Aarts, L.T., Davidse, R.J., Louwerse, W.J.R., Mesken, J., et al. (2006). Herkenbare vormgeving en voorspelbaar gedrag. Een theorie- en praktijkverkenning. R-2005-17. SWOV, Leidschendam.
. CROW (2012). Basiskenmerken wegontwerp: categorisering en inrichting van wegen. Publicatie 315. CROW Kenniscentrum voor verkeer, vervoer en infrastructuur, Ede.
. Theeuwes, J. (1994). Self-explaining roads: an exploratory study. TM 1994 B-18. TNO Technische Menskunde, Soesterberg.
. Aarts, L.T., Davidse, R.J. & Christoph, M. (2007). Herkenbaar wegontwerp en rijgedrag. Een rijsimulatorstudie naar herkenbaarheid van gebiedsontsluitingswegen buiten de bebouwde kom. R-2006-17. SWOV, Leidschendam.
. Van Schagen, I.N.L.G., Wegman, F.C.M. & Roszbach, R. (2004). Veilige en geloofwaardige snelheidslimieten. Een strategische verkenning. R-2004-12. SWOV, Leidschendam.
. Houtenbos, M. (2009). Sociale vergevingsgezindheid. Een theoretische verkenning. R-2009-8. SWOV, Leidschendam.
. Fuller, R. (2005). Towards a general theory of driver behaviour. In: Accident Analysis & Prevention, vol. 37, nr. 3, p. 461-472.
. Davidse, R.J., Vlakveld, W.P., Doumen, M.J.A. & De Craen, S. (2010). Statusonderkenning, risico-onderkenning en kalibratie bij verkeersdeelnemers. Een literatuurstudie. R-2010-2. SWOV, Leidschendam.
. Terlouw, J.C., Doef, J.C.T.v.d., Leemhuis-Stout, J.M., Koning, B.N.d., et al. (2001). Verkeersveiligheid in gedecentraliseerde banen: investeren in cultuur en structuur. Eindrapport. Bevindingen en advies van de visitatiecommissie (commissie Terlouw) naar aanleiding van COVER, de evaluatie van drie convenanten verkeer en vervoer. In opdracht van Directoraat-Generaal Rijkswaterstaat, Adviesdienst Verkeer en Vervoer AVV, in opdracht van Het Nationaal Verkeers- en Vervoersberaad (NVVB). Directoraat-Generaal Rijkswaterstaat, Adviesdienst Verkeer en Vervoer, AVV, Rotterdam.
. VNG, IPO, VenW & UVW (1997). Intentieverklaring van de Minister van Verkeer en Waterstaat, het Interprovinciaal Overleg IPO, de Vereniging van Nederlandse Gemeenten VNG en de Unie van Waterschappen UVW over het Startprogramma Duurzaam Veilig. Den Haag.
. VenW, IPO, SKVV, VNG, et al. (2003). Landelijke afspraken tweede fase Duurzaam Veilig. Afsprakenlijst, versie 15 April 2003. Ministerie Verkeer en Waterstaat, Den Haag.
. Weijermars, W.A.M. & Van Schagen, I.N.L.G. (2009). Tien jaar Duurzaam Veilig. R-2009-14. SWOV, Leidschendam.
. Aarts, L.T. (2016). Risicogestuurd verkeersveiligheidsbeleid. Wat is het en wat kun je ermee? Paper gepresenteerd op Nationaal Verkeersveiligheidscongres 2016, ’s Hertogenbosch.
. Trafikverket (2012). Review of interim targets and indicators for road safety in 2010–2020 - Analytic report. 2012:162. Swedish Transport Administration (Trafikverket), Borlänge.
. CROW (2011). Duurzaam Veilig en Shared Space – een vergelijking. Publicatie 303. CROW kenniscentrum voor verkeer, vervoer en infrastructuur, Ede. SWOV (2017). Sustainably safe road traffic. SWOV Fact sheet, October 2017. The Hague.